If you are looking for an exquisite and unique award to present someone, look no more! Our Red and Blue Helix Art Glass Award makes an extraordinary accolade for that extraordinary individual in your company, service organization, or school. Standing over a foot tall (15.5”) and weighing nearly eight pounds, this piece has red and blue arms which twist around each other. The art award comes anchored to a transparent glass base, and the base provides plenty of room for personalization of this gift. Our design department will use laser technology to engrave up to four lines of text on the base. Simply give us the name of the lucky recipient, a date, and the reason for the award, and we will do the rest. Engraving is free, and we will cover the shipping costs for this exceptional award. 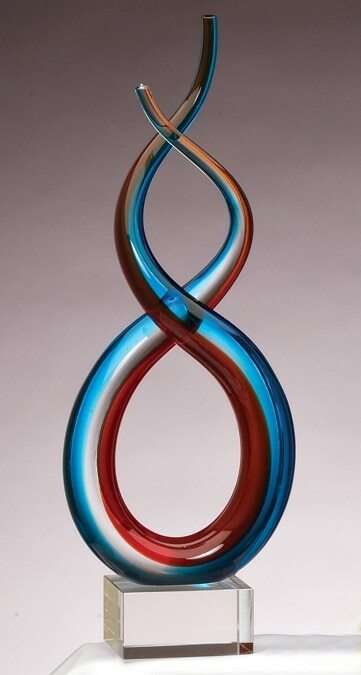 Give our Red and Blue Helix Art Glass Award to someone and make that person feel irreplaceable to your organization!